The date of early bird is extended to Aug. 26th, please make a registration right now! View the programme schedule for BlogTalk 2009. Keynotes, invited tracks and panel discussions. Find out how to get to Jeju Island, Korea. Hotels near the conference venue. 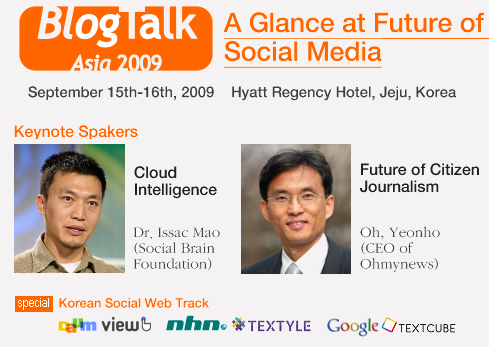 Read our blog for the latest updates on BlogTalk 2009. Food and liquid refreshments you may enjoy. Our distinguished organising and programme committees. More about the past five conferences on social software.